The Arp Museum Bahnhof Rolandseck is one of the most attractive art museums in the Rhineland and impresses visitors with its unique architecture. 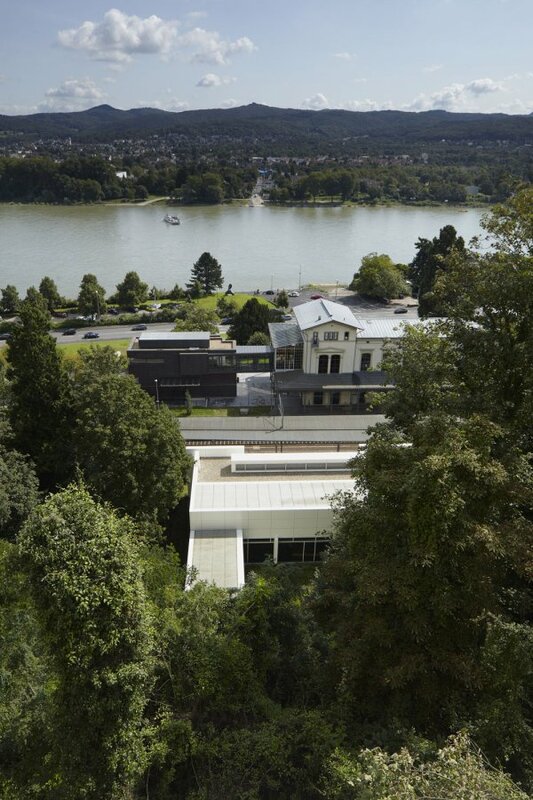 Consisting of the historic station building and the modern building by the American architect Richard Meier, the museum affords impressive views across the Rhine to the mountains of the Siebengebirge on the far bank. The route linking the two buildings runs partly along an underground passage which is an architectural experience in its own right. Below you can find out more about the architecture of this remarkable ensemble: first we shall introduce you to the station building with its long historical tradition, and then we shall move on to the new building on the heights overlooking the Rhine. The world's first railway line was inaugurated in 1825 in England. Thirty years later the railway also came to Rolandseck. Bahnhof Rolandseck is a late Neo-Classical building, completed in 1856 by master builder and engineer Emil Hermann Hartwich (1801–-1879). It is still linked into the rail network today. The fact that this imposing railway building stands in such a small place can be ascribed to the golden age of Rhine Romanticism in the nineteenth century. 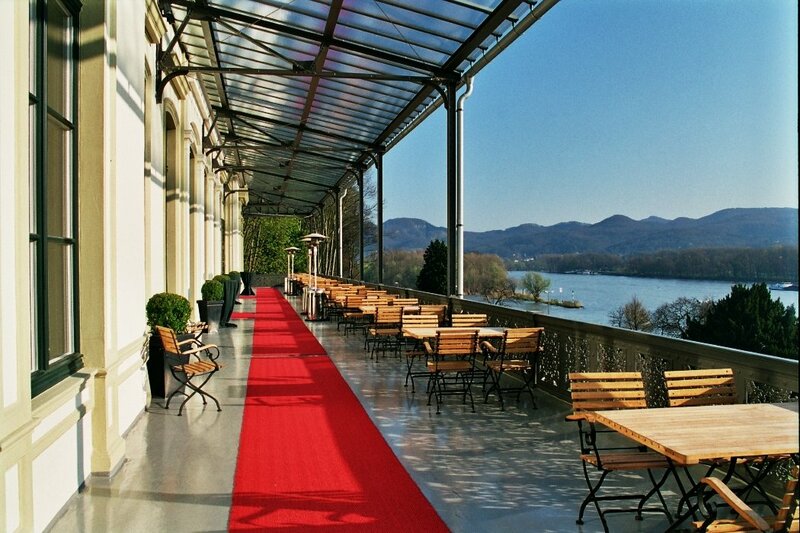 Surrounded by excursion destinations like the myth-laden Rolandsbogen, the Drachenfels with its castle and ruins and Burg Stolzenfels, the station was once the arena for social and artistic events and fits perfectly into the picturesque Rhine countryside. Lying as it did away from the main traffic hubs, the building was fortunately spared destruction during two world wars. Today it is considered an important cultural monument to the art history of the Rhineland and the early years of railway construction. The building is a representative example of the new concept of architecture of the industrial age and bears witness to the skills of engineering. Above all the ornamental supports and balustrades on the terraces are fine examples of Rhineland decorative cast iron. As an architect Hartwich was influenced by the Neo-Classical style of the famous Prussian master builder Karl Friedrich Schinkel. Balance, harmony and symmetry are the design principles governing the architectural structure of the building. The two-storey main building is flanked by two two-and-a-half-storey corner buildings, whose shallow gables rise above. It stands on a roughly cube-shaped plinth which today houses the main entrance to the museum. It originally served as a carriage house where the horses and carriages were looked after. To the left and right of the entrance, a double-flight staircase leads up to the first floor, where once the station hall and the third and fourth-class waiting rooms were located. This level, at the same height as the rail tracks, is used today as an exhibition area. The second floor, which now houses the Bistro and the two banqueting halls, used to contain the first and second-class waiting rooms. Even back in the nineteenth century the magnificent large banqueting hall was a popular meeting place for famous personalities from society, politics and art. 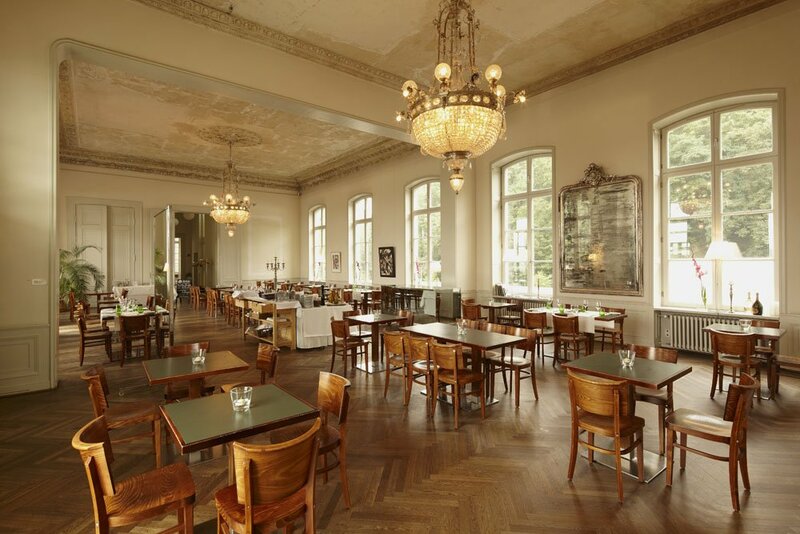 The former social classification of the floors can also be seen in the structural design: the windows and door frames and especially the cast iron railings of the viewing galleries are particularly artfully designed, especially on the second floor. 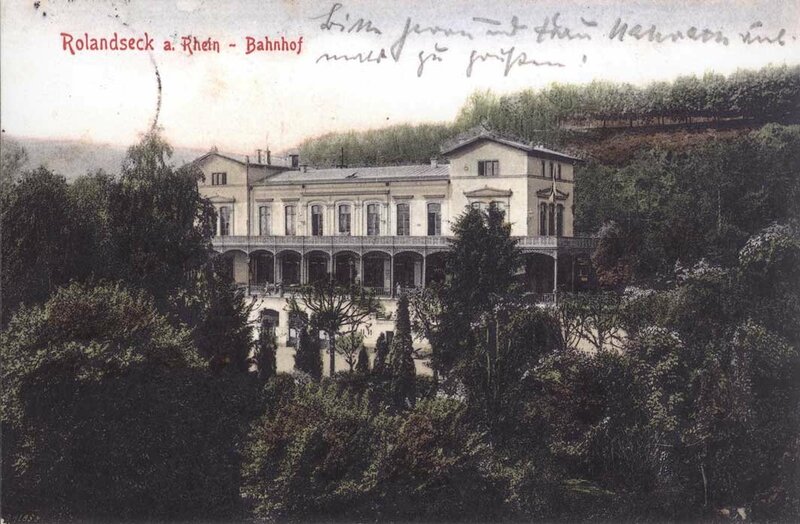 Since 1981 the Bahnhof Rolandseck has been a protected building, maintained as a valuable art-historical reminder of the early years of the railway. A comprehensive renovation programme for the historic building began in 2000. During the course of the renovation, the historic ceiling paintings in the exhibition rooms and banqueting halls were revealed. 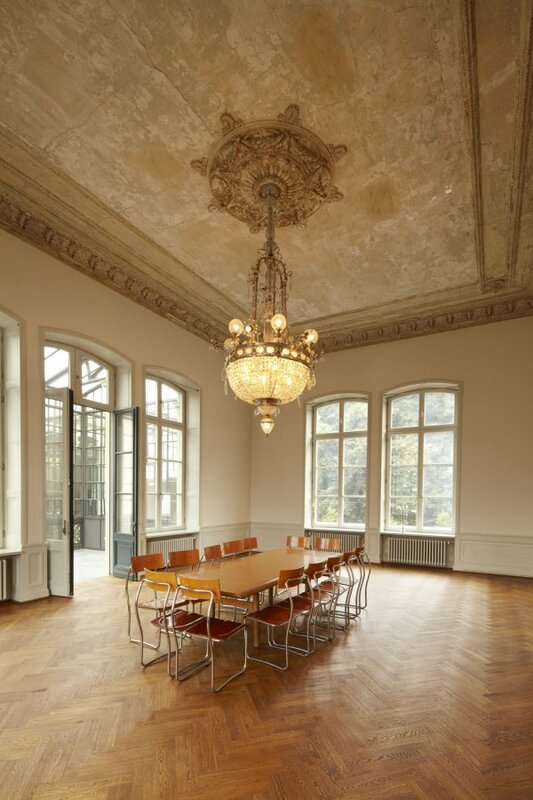 Together with the imposing crystal chandeliers and the unrendered stucco they create a striking atmosphere. In keeping with the tradition, these rooms are used today not only for guests' refreshment but also for concerts and events. On the outside staircase on the first floor you will find the public station toilets. These were designed in 1972 by the British artist Stephen McKenna and serve as a permanent reminder which gives an impression of the celebrated Künstlerbahnhof (artists´ station) during the 1960s and 1970s. 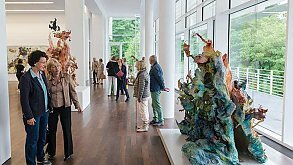 Since part of the estate of Hans Arp and Sophie Taeuber-Arp arrived at the Künstlerbhanhof at the end of the 1970s, the function of the building as a museum gradually gained the upper hand. The care of the Arp Collection soon prompted the plans to extend the station with a new building. However, several years would pass before the present complex consisting of the old and the new building which now form the Arp Museum Bahnhof Rolandseck could be completed. 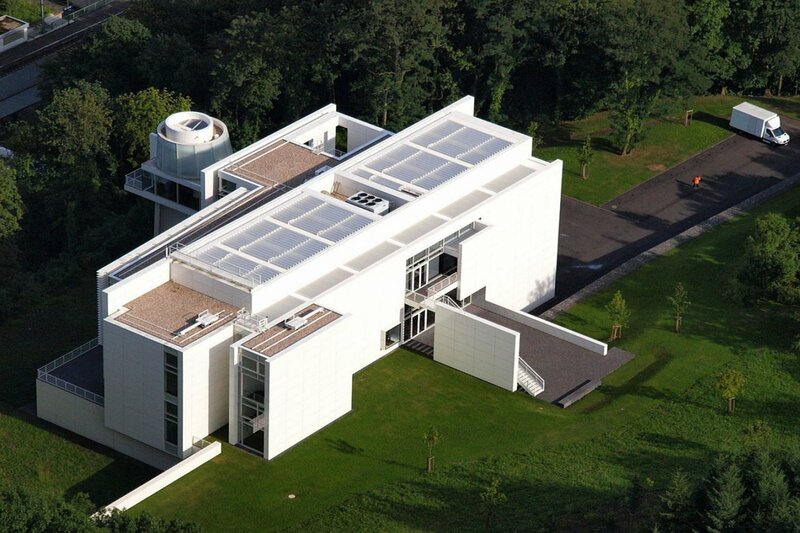 Johannes Wasmuth had met the American architect Richard Meier during the 1970s. Together they developed plans for a museum which was to be dedicated to the art of Hans Arp and his wife Sophie Taeuber-Arp. They had plenty of ideas, but the financial means were lacking, and so initially the plans could not be realised. 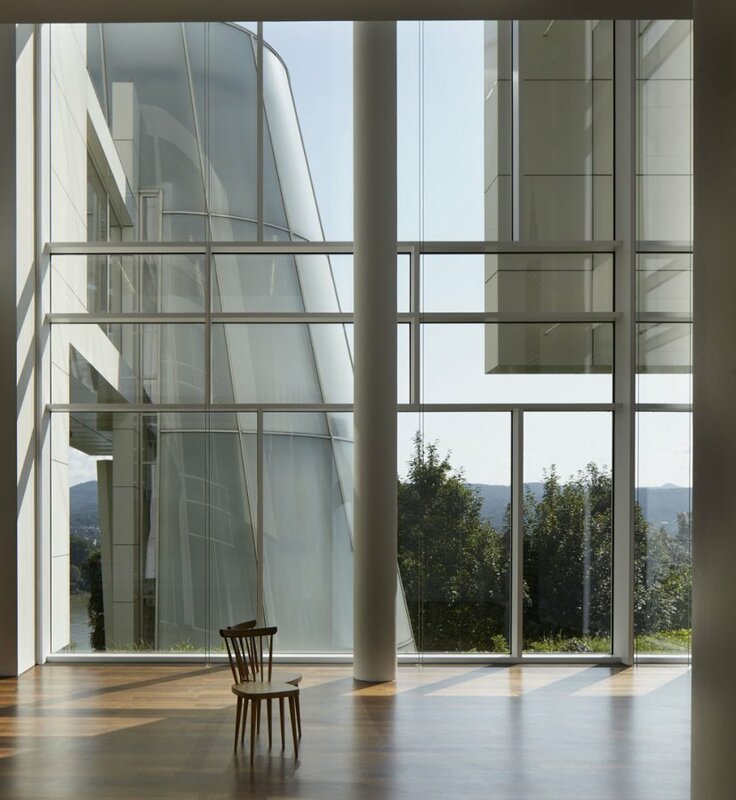 Richard Meier, who had remained loyal to the project, had in the meantime extended his experience in museum construction. With buildings like the High Museum of Art in Atlanta, the Museum of Contemporary Art in Barcelona and the Getty Center in Los Angeles he is one of the world's most important contemporary museum architects. 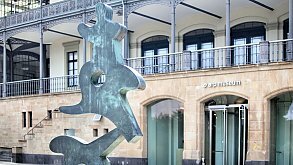 After they had finally arranged the financing of the project with help from politicians and with funds from the Land of Rhineland-Palatinate and the Bonn-Berlin Compensation Fund, the Arp Museum opened officially in the Bahnhof Rolandseck in 2000. Parallel to the comprehensive renovation work in the station building, the foundation stone was laid for the new building on the heights above the Rhine. 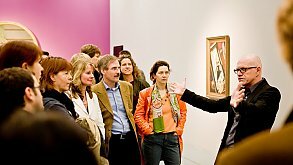 In September 2007 the museum complex was opened by the Federal Chancellor, Angela Merkel and the Prime Minister of Rhineland-Palatinate at the time, Kurt Beck. 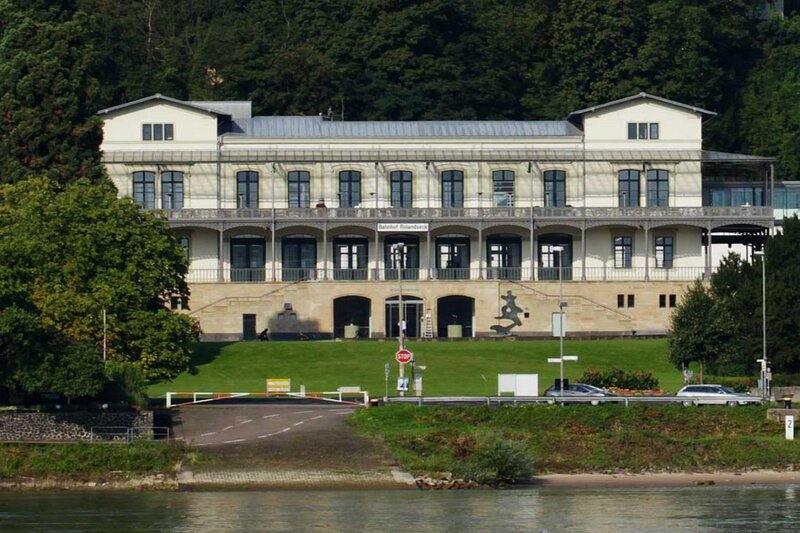 The new wing is a unique building complex: the Neo-Classical station building is linked by an exciting subterranean architecture passage with a new exhibition pavilion on the other side of the railway tracks and Meier's modern white castle perched 40 metres above the Rhine. 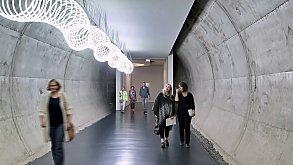 With 2,500 m² of exhibition area the museum has already established a firm place on the national and international museum scene. From the foyer in the station visitors enter a first tunnel, which leads down underneath the railway tracks. 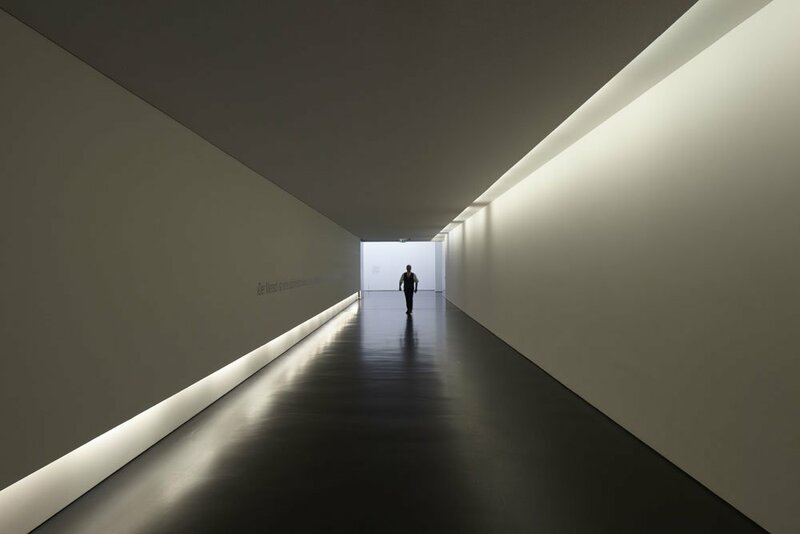 At the end of the tunnel they step into the light: the ceiling is glassed-in and affords views of the sky and the surrounding landscape. 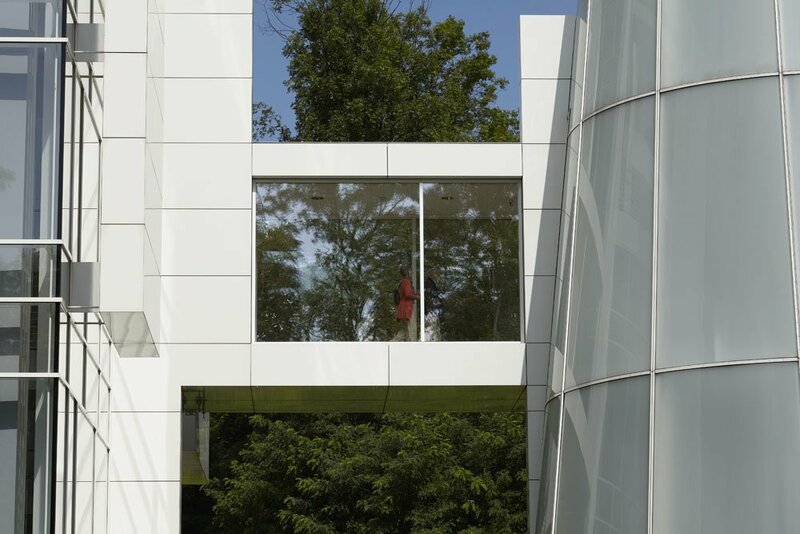 This opening to the outside is one of the main characteristics of Richard Meier's architecture. Through the expansive glass fronts or carefully positioned smaller window openings he integrates the surroundings like landscape paintings into the impression created by the space. 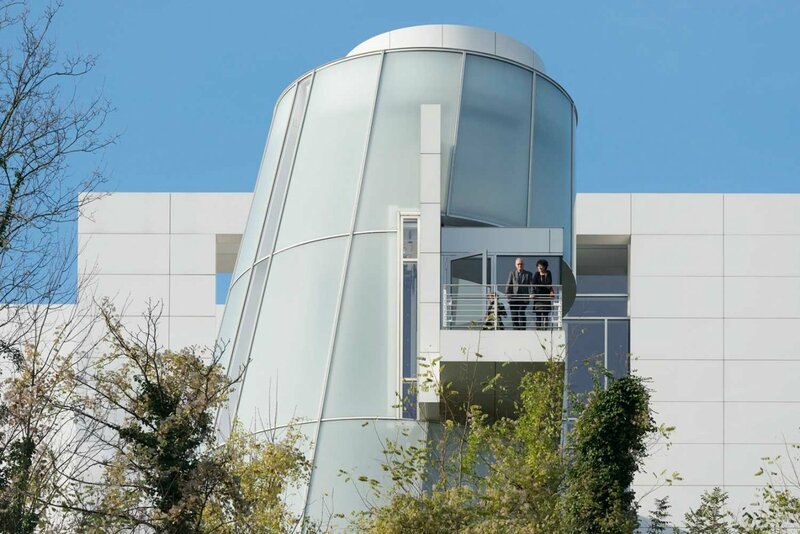 If you go up the staircase on the right you will pass by a glass façade which permits a view of the glass lift tower leading up right through the slope. First, however, an exhibition room opens up to view as it lies like a block parallel to the corridor and the railway tracks. It is the exhibition pavilion of the Kunstkammer Rau. 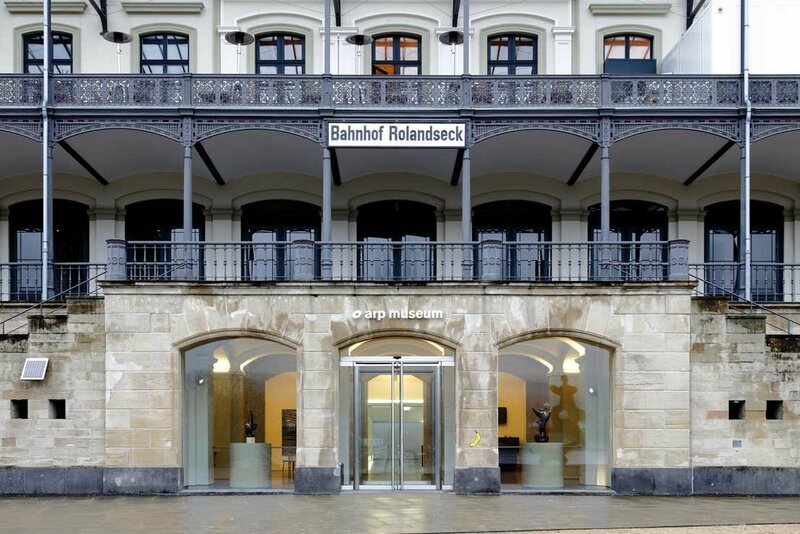 Since 2009 it has housed the Rau Collection for UNICEF, which will be presented as a long-term loan in changing exhibitions in the Arp Museum Bahnhof Rolandseck until 2026. The pavilion is windowless and thus provides a large amount of wall space and UV protection for the valuable paintings of the Rau Collection. The corridor in front of the Kunstkammer leads into a second tunnel. It was driven into the sloping banks of the Rhine, as you can see from its round cross-section and the unclad concrete walls. 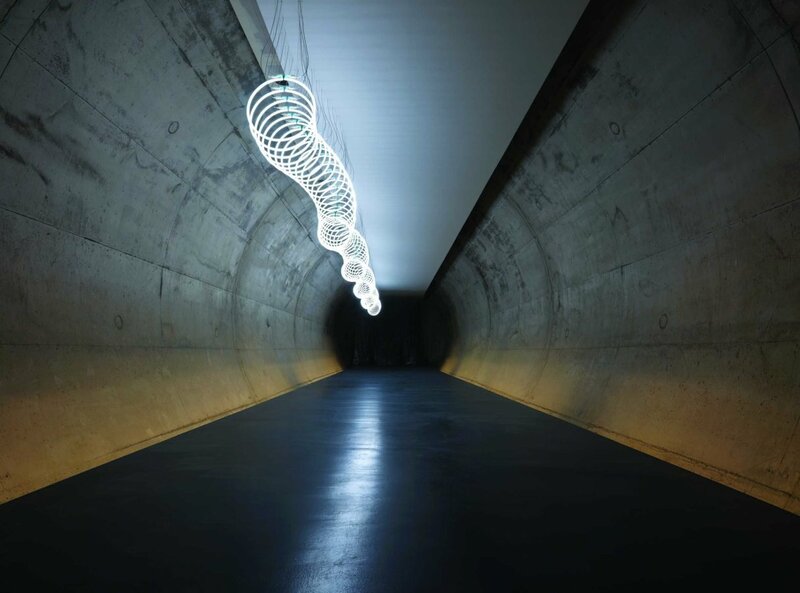 Passing beneath the light installation »Kaa, die Schlange« (»Kaa the Snake«) by Barbara Trautmann, at the end of the tunnel we reach the lift tower, which leads into the new building by Richard Meier. Two glass cabins or 230 steps lead up the hillside. The walls of the lift shaft are not clad. Instead, through the glass walls of the lift you can still recognise the traces of the vast hollow drills which ate into the soil here. You finally emerge from the narrow, dark shaft into the light truncated cone closed off with frosted glass, which could be seen from down below. 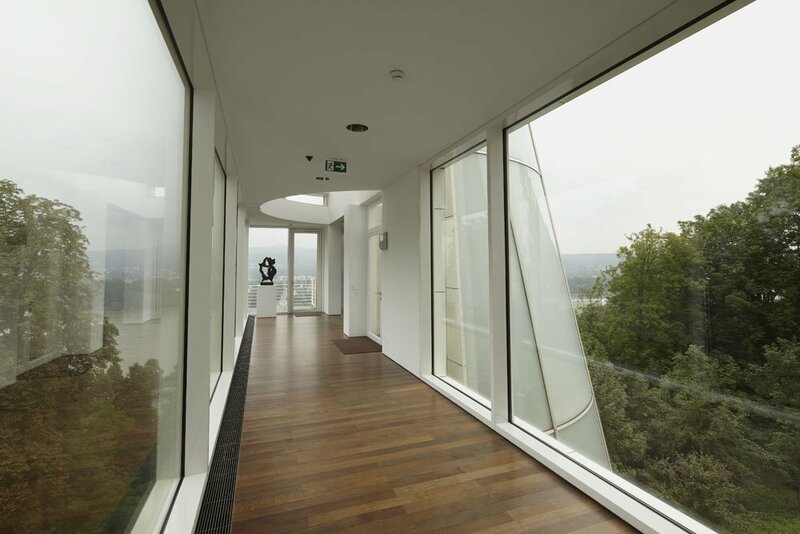 A narrow band of clear glass allows us to look outside and enables us to guess at the view awaiting us when we leave the lift: the glass passage which links the lift tower and the main building, and which has been furnished with a viewing balcony, offers a wonderful view across to the Rhine and the Siebengebirge mountains. The three-storey new building resembles a modern, white Rhine castle – not watchful and forbidding as in the old days, but an open and inviting place of art. Incidentally, the outside terraces are all accessible during the museum opening times. Inspired by the architecture of Le Corbusier, Richard Meier adopts the idea of the supporting columns which carry the building. Since the façade is released from its static function, it could be designed in an unrestricted way with large areas glassed in. 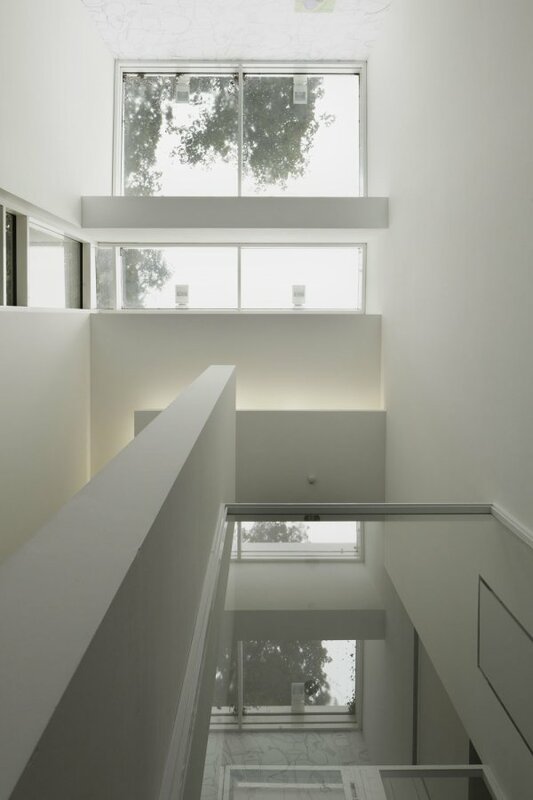 In this transparency the architecture and the surroundings flow smoothly into each other. Meier is not content, however, simply with a continuous glass façade, but structures the surface by adding layering to the different levels. 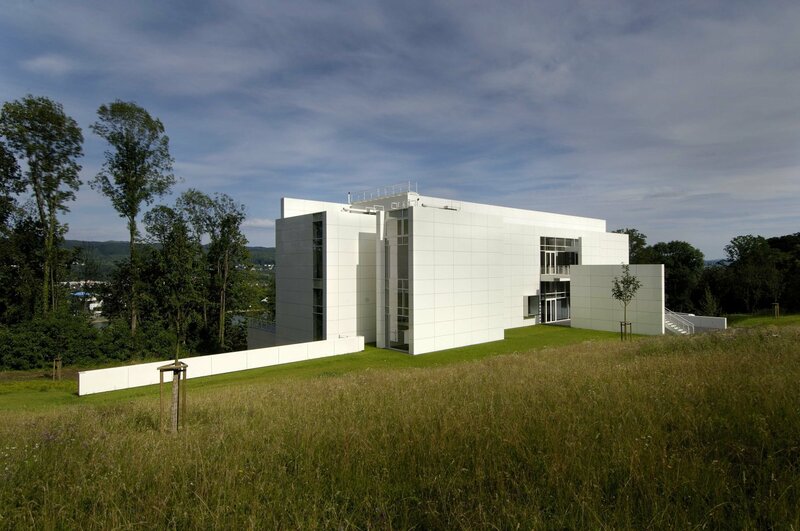 The positioning of the staircases, the blocks of the building and the white construction elements typical of Meier's works grant a view of the landscape that is unobstructed on the one hand and then repeatedly restricted on the other. Meier plays with transparency and veiling, creating lines of sight and thus influencing the perception of the viewer. The three levels of the new building are linked by an open stairwell with suspended stairs. This results in links between the lines of sight through the entire height of the building and a light, bright atmosphere is created. 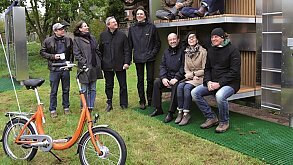 Claus, Sylvia / Schirren, Matthias / Kornhoff, Dr. Oliver (Hg. ): Building as Art. 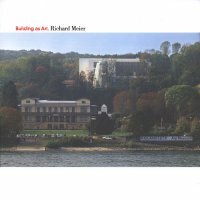 Richard Meier, Remagen 2012.